On Sunday October 16th, 2016, join L’Abri en Ville residents, volunteers, staff, family and friends as they march in the streets to raise awareness and funds for mental health initiatives at this year’s Montreal Walks for Mental Health. 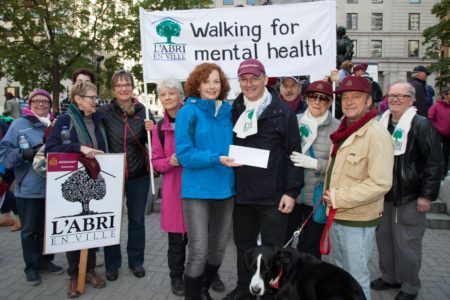 Last year the Montreal Walks for Mental Health was again a big success as L’Abri supporters participated in great numbers adding their voice to the cause and raised $2,153 for our organization. Furthermore, The Montreal Walks for Mental Health Foundation awarded L’Abri en Ville a special grant of $4,500 which enabled us to outfit the apartments of L’Abri residents with air conditioning units, providing a healthier, cooler summer for many years to come. Join us again this year, Sunday October 16th, on this ‘’walk towards a world without stigma’’ while raising funds for L’Abri en Ville.